“So far, I haven’t seen him smoke or drink and he’s got a slightly different body shape to his old man,” the South Australian coach talks of 22-year-old, who will likely be playing his his first match for South Australia in the upcoming Matador One-Day Cup. Berry’s close friend, who has a liking for a cold beer and a cigggie, also talked about the the senior’s record with respect. He praised Lehmann’s all-time leading run scoring record in the 122-year history Sheffield Shield and said it won’t be over taken and also that his prestige has increased ever since he took over as the Australian coach. The left hand batsman and bowler captained South Australia, played 27 Tests and 117 one-day internationals for Australia, and even has a bronze statue at Adelaide Oval. Jake Lehmann, who recieved the call-up to the SA’s 14-man Matador Cup squad, earning his first rookie contract last year with West End Redbacks, anticipated what he will be against when he faced the media conference. “Obviously there’s been expectation growing up but I’ve just tried to take it in my stride and be my own person and play cricket the way I want to play cricket,” the laconic left-hander answered when put-up against the expectations he carries for the famous surname. He replied calmly when he was questioned about whether he was influenced with his father’s batting style during his upbringing years. “He was away a lot so it was just natural – I just went out there and enjoyed it and he never overpowered me at all. “There was always that name around, but I love cricket and I’ve always been around cricket since I was a young kid. He remembered the time when his dad was delivering goods for South Australia and also for a short period for Victoria. “He (Darren) is obviously in Dubai (with the Australian limited-overs team) so I haven’t spoken to him in person, but he’s sent me some nice messages saying he’s proud and if I get an opportunity to play some cricket for the State to take it and enjoy it. People who are questioning whether the young cricketer has got the chance at senior level with something other that his batting talents should follow up on his days as a teenager in the grade competition in Adelaide last summer. Lehmann Jr. was rewarded for his marvellous season with East Torrens, wherein he scored 492 runs at 37.85 in Grade Cricket and 255 from seven Futures League innings. 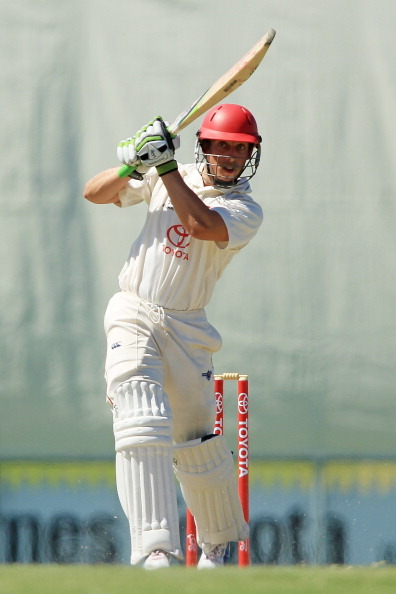 The performances and accolades earned him his rookie contract and the form he showed in the Redbacks’ pre-season matches and the SA Premier League made Berry realise that the 22-year-old was ready for a higher responsibity. “He got a rookie contract this season and his body shape has changed completely and as a result – not just because of that – throughout pre-season he’s got 50s and 60s and then most pleasing (last weekend) in the Premier League he scored his first hundred. “So he’s right in the mix. “He bats on the same side (left-handed like his father), he’s got really good hands, and he’s got an eye like his dad as well. “He plays the ball late, and I think he’s a really exciting talent - he’s one that’s crept up on us to be honest. “Obviously Darren was a sensational player but Jake’s now got it all before him to make his own mark and that’s what I’ve said to him – ‘don’t worry about the expectation of what your dad did, just be Jake Lehmann’. Berry remarked on being asked, if he will feature in the Redbacks Matador Cup match agaisnt New South Wales Blues on Saturday in Brisbane. With the same composure he also replied stoically to when he would get a chance to his prestigious Baggy Green cap. “Obviously everyone’s dream is to get a Baggy Green,” he said. Boof jr. happilly will tell you that he is an individual, on his own journey, playing his own game at his own pace and the comparisions with his famous and respected father will always be there as one of Australian cricket’s legend.